The current sociopolitical climate in America and much of the English speaking West is just the pits. People are being fired from jobs for something they did years and years ago because their employers fear the backlash from the PC brigade. And it's fueled by social media hugboxes and echo chambers and 'online activists' who get a thrill out of ruining someone's life in the name of some effed up PC cause. Welcome to the post world wide web, where everything you say online will be dredged up in years to come and used against you. disney needs to get a grip on REALITY. without the original stars, there IS no part 3, and they can't force the actors to make the movie, as far as i know. The actors might be under contract; if so they'd probably need to pay a huge fee or give up the other films' royalties to get out of it. The cast put out an open letter. Also, Rooker has quit Twitter because of this and deactivated his account. 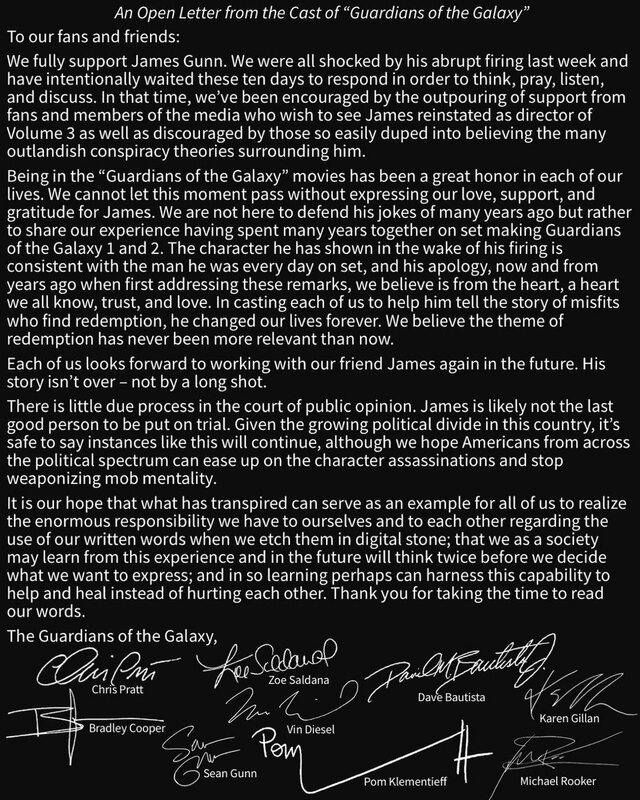 Sources say there has been a growing feeling that Gunn could be reinstated, especially because Marvel and Disney have been unusually radio-silent on who could replace him since the firing. Production is slated to start at the top of 2019, and following Gunn’s removal from the film, it was thought that Marvel and Disney would need to move quickly to replace him, since the replacement would likely have to do some work on the script. With Walt Disney chairman Bob Iger out on vacation currently, insiders believed a decision would not be made until he returned to work. Looks like James Gunn is in even deeper doo-doo than expected. Now there's photos of him dressed as a Catholic priest at a themed costume party. A fancy dress party with a pedo theme??? I read some of the jokes he tweeted years ago, they were in very poor taste. And these pictures are bizarre, to say the least. At the same time, there are people who are accusing him of being a hidden pedo, and I don't agree. If he was using humour in a very provocative and socially extreme way, I can see how a person might joke like this for shock value.